On spirits: "Pick your favorite cocktail—such as the Martini, Manhattan, or Margarita--and buy all the ingredients to make it. 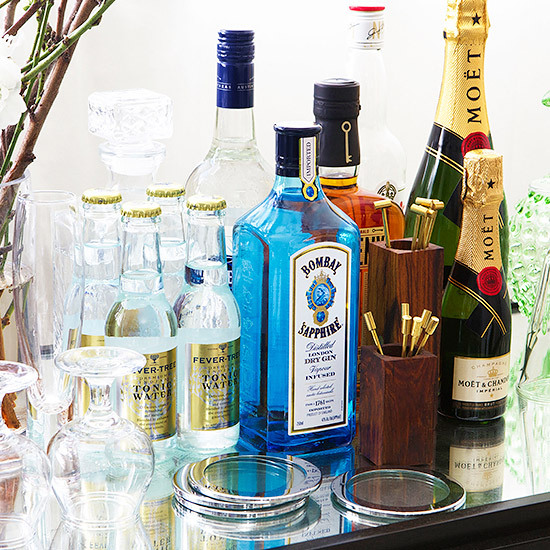 The next time you want to make cocktails at home, pick another drink, and do the same. " On bitters: "Start with a bottle of Angostura Bitters, and if you get bit by the cocktail bug, expand your collection to an orange bitters and Peychaud's Bitters." On citrus and garnishes: "For garnishes, the primary fruits to keep around are lemons, limes and oranges; grapefruit is used less often. A jar of cocktail olives (stuffed or not depending on your preference) and cocktail cherries may be kept in your refrigerator." On glassware: "Choose glasses that you find attractive: four to six champagne coupe glasses, Martini, highballs and rocks glasses are a good place to start. Glassware is important, but the quality of the liquid you're putting in them is more important." On bar tools: "You can stir drinks with a chopstick, shake drinks in a Tupperware jar, strain drinks using a soup spoon, muddle with a rolling pin, or fine strain through a towel. With that said, it's a whole lot more elegant--and easier--when you have bar tools made for mixing drinks." Head over to DuJour to read more of Meehan's tips for stocking your bar, as well as a few of his go-to recipes.